Non prescription diet pills outnumber their prescription only counterparts by quite a big margin. There are several commonly prescribed diet drugs as opposed to several dozen even a couple of hundred free to buy non prescription diet pills. Adipex is most definitely a prescription diet pill – it is a strong powerful chemically and pharmaceutically produced drug aimed at the obese and should not be entered into lightly. Adipex is also known as Adipex-P and has an association with and contains Phentermine as an active ingredient. 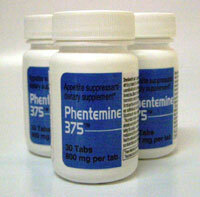 The active ingredient of Adipex is Phentermine, as mentioned above. Phentermine causes as reaction of the neurotransmitters in the brain. It stimulates selected nerve bundles to release chemicals that act as neurotransmitters. As with a majority of prescription diet drugs – Adipex is prone to causing side effects, some serious and some a minor inconvenience. As described above, Adipex is only suitable for dieters who are considered extremely over weight or obese. It is not available on request and can only be obtained via GP or doctor consultation. However there are certain groups who should avoid taking Adipex altogether. Anyone with a history of heart disease or high blood pressure should refrain. Anyone with an overactive thyroid should also avoid. If you have had a history of eye conditions such as glaucoma or blood disorders such as arteriosclerosis (artery hardening) Adipex should not be taken. The group of people that should particularly avoid are those with an addictive nature or a history of alcohol or drug abuse. Adipex cannot be purchased it can only be acquired via GP or doctor consultation. The internet is great resource but can also be a breeding ground for the black market. It is highly advised to not attempt to buy Adipex from the internet – it is highly likely you will be buying a fraudulent product. Phentermine is possibly the most widely prescribed appetite suppressing diet drug. It was very strong and had to be administered under GP supervision. Phen375 is derivative and contains a fat burning agent, it is manufactured in FDA approved facilities and available to buy without prescription.